You can also access all our links to low carb weight loss recipes; raku, stoneware, and salt fire (salt glazed) pottery; zen; submarine games; and Tip O' The Ice Cube, our comic strip series by clicking montefin's Site Index Page. Feel free to , so you can easily return whenever you want to make this. Remove the Giblets, Liver and excess Fat from neck and body cavities of the Goose. Set the giblets aside for stock and the liver aside for the stuffing. Wash the bird inside and out and pat with paper towels. Set aside to let the skin dry while you prepare the stuffing . Fill a sauce pan with water and make a stock with the Neck, Gizzard and Heart. Slice the top and bottom off the Red Onion and add them with the Bay Leaf to the stock. Simmer for 20 minutes. Meanwhile, render the oil from one of the larger pieces of goose fat in a sauce pan over medium heat. Remove the crackling when the fat is rendered and set aside. Lightly sautée the Onion in the hot fat. Add the chopped Goose Liver, then the pieces of Macintosh Apple, clove of Garlic and whole Cranberries. Stir until apple and cranberries soften. Add the Bulgur and stir vigorously to spread the color of the cranberries. Pour in about 1 cup of the hot Giblet Stock. Keep stirring and lower the heat. Add the Basil, Thyme, Parsley, Sage, Nutmeg, Marjoram and Cayenne Pepper. When the bulgur has absorbed all the water (about 10 minutes) remove from heat and stir in the Egg Yolks, Stevia and uncooked Celery. Crumble the piece of crackling and add it, too. Cool this mixture to about room temperature in the refrigerator while you prepare the Goose for roasting. With a small, razor sharp knife (an X-acto knife works fine) cut 1/4" slits all over the skin. Be more like D'Artagnan than Norman Bates. This will give the finished roast a crisp, lacy surface. Rub the Coarse Salt all over the goose followed by the Butter. 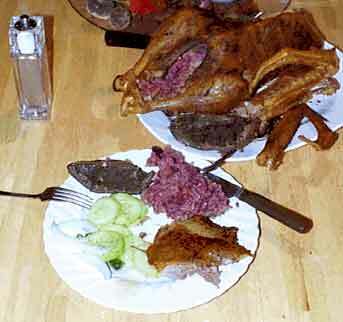 Fill the neck and body cavities of the goose loosely with the stuffing. Sew the neck skin closed and plug the body cavity closed by working the Whole Portobello Mushroom Cap inside and pressing it lightly against the stuffing. Tie the legs together and place the goose on a rack in a shallow roasting pan. Pour the Boiling Water into the bottom of the pan and put the pan in the pre-heated oven. After 20 minutes at 400° F. turn the oven down to 375° F. and roast 25 minutes to the pound or until an instant read meat thermometer registers 140° F. in the thickest part of the thigh. As the goose roasts, the water will steam off and copious fat will collect in the bottom of the pan. Use this to baste frequently, but also remove most of it to a fairly sizable jar with a bulb baster. It is wonderful to fry potato slices or onion rings in at a later date. When your goose is done, remove from oven and let rest on the table for 15 minutes before carving, the internal temperature will rise another 5°. I like a cold side dish with goose, especially sliced cucumbers and onion marinated briefly with slices of serrano chile and fresh cilantro leaves in a 5 to 1 water-vinegar solution. Less than 18 net Carbohydrate grams per serving which includes one 1/2 cup serving of stuffing. Less than 3 grams without the stuffing.